Attaullah Khan Niazi Esakhelvi is also known famously known as 'lala' which means elder brother. He is traditionally considered a Seraiki artist, but his music albums are in seraiki & punjabi. The Government of Pakistan awarded him the Pride of Performance Award in 1991. His songs are extremely soulful and easy on the ears. Listen to this compilation of handpicked songs from the vast ocean of his collection. Like, Comment and Share this video with everyone you love. 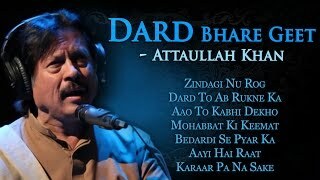 To Enjoy Best Of Attaullah Khan, Download The Best Of Attaullah Khan App on your phone.